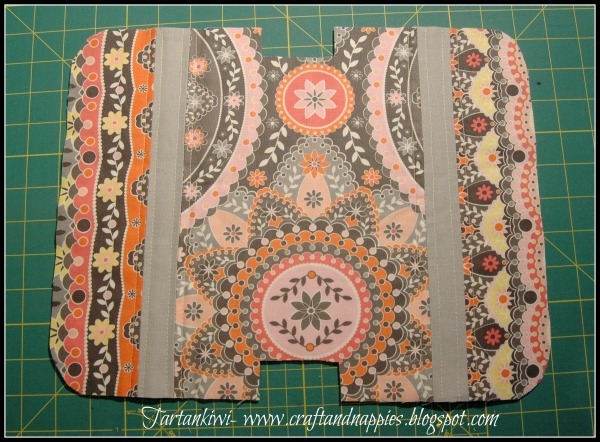 I was recently honoured to be chosen to take part in the Totally Tutorials Exchange Program. 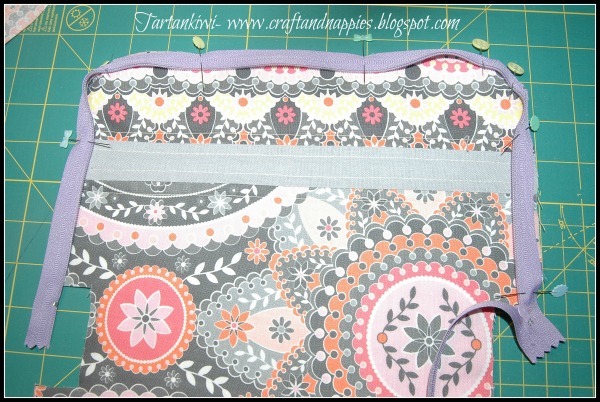 In return for a yard of beautiful fabrics from Jenean Morrison's Silent Cinema fabric line (which was provided by Fabric Fascination), I was asked to create a tutorial. Much as I loved the fabrics, I was initially at a bit of a loss as to what to make with them, but after a bit of brainstorming session with friends, I came up with a plan. Regular readers of my blog must promise not to laugh. You see I seem to have been on somewhat of a campaign of making sewing cases recently. Although I have loved each and every one that I have made so far, most of them have a fatal flaw. They don't have zips so there is a distinct possibility that they will tip up in your bag and everything will fall out- not good! 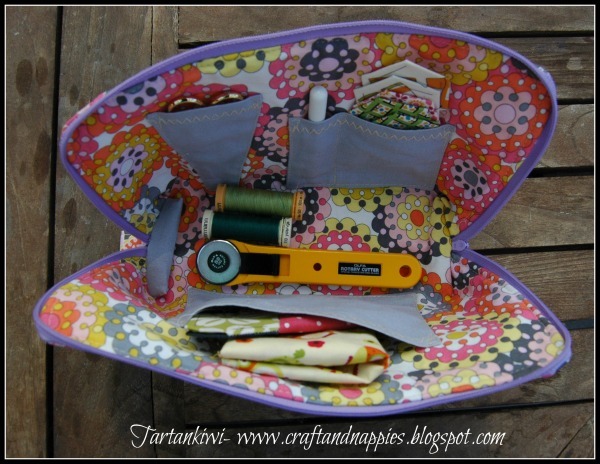 I hope you like the Zipped Sewing Case that I designed to cope with this problem. 2 strips of quilting weight fabric measuring 3" x 12"
2 strips of strip Essex Linen measuring 1.5" x 12"
1 piece quilting weight fabric 7.5x 12"
1 piece contrasting fabric measuring 4.5" x 6.5"
1 piece contrasting fabric measuring 7.5" x 6.5"
2 pieces quilting weight fabric 2.5" x 3"
3" strip then 1.5" strip then 7.5" strip then 1.5" strip then 3" strip. 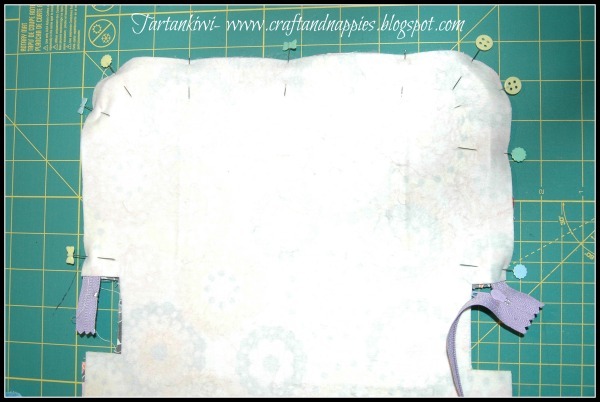 Once you have done this, press the seams open and then iron the fusible fleece onto the back of the pieced fabrics. Now iron the stiff interfacing onto the back of the fusible fleece. At this point I did a little bit of quilting. To be honest, part of the reason for this was that I didn't trust the stiff iron-on interfacing that I had to stick, but I like the effect that it gave and would not hesitate to do it again. 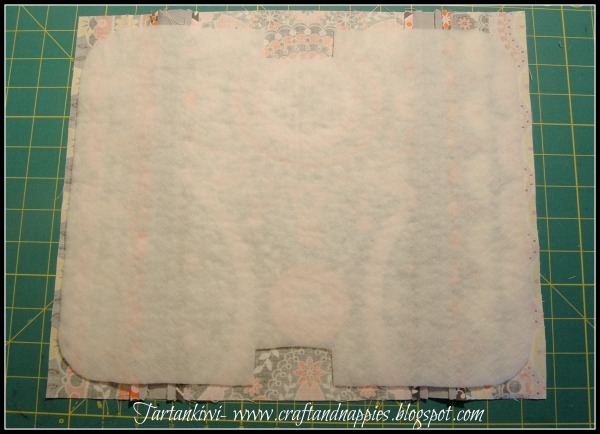 Once you have done this, cut the outer fabric to the same shape and size as the fusible fleece. Your outer fabrics are now ready, so lets turn our attention to the lining. Iron the interfacing onto the back of the lining fabric. Fold the scissor holder in half lengthways. 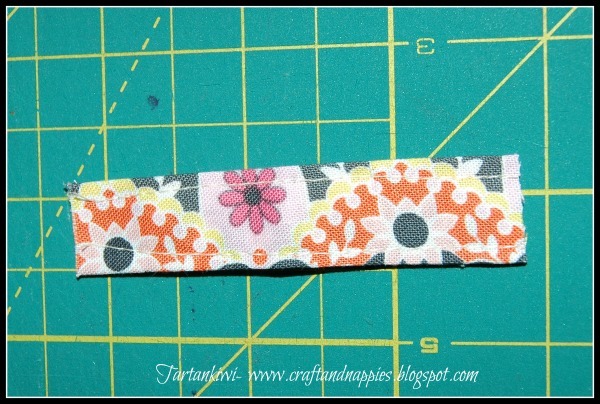 Sew around the edge, leaving a 2" opening on one of the longer sides. Clip the corners. Turn the right way out. Make sure that you poke the corners out properly and then iron. 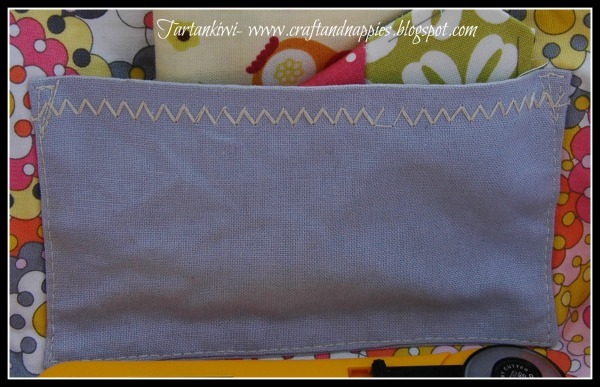 If you like, you can do decorative stitching along the top. 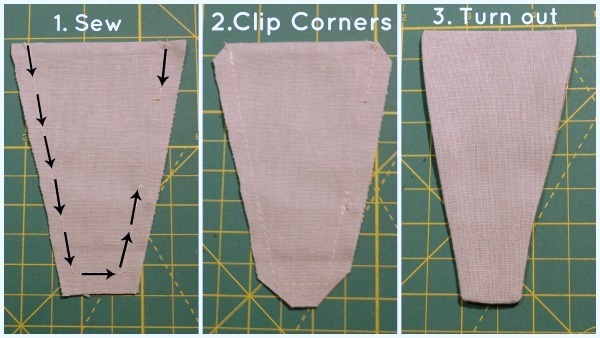 Repeat these last steps to create the other two pockets. 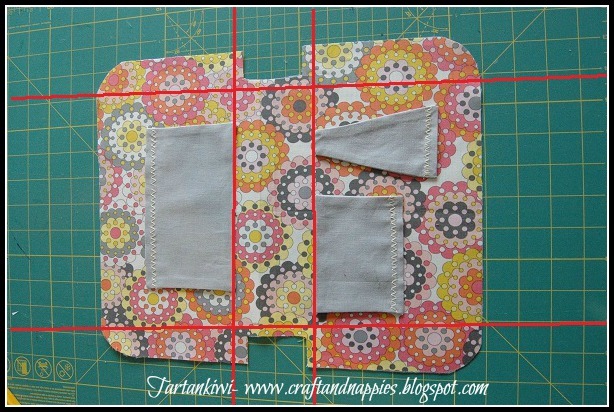 The smaller pocket should be folded in half creating a piece 4.5" x 3.25". The larger pocket should be folded in half making a piece 7.5" x 3.25". Position the pockets carefully on the lining fabric. Make sure that you take the contours of the pouch into account and don't place any pockets in positions where the will cross a fold (see diagram below where the red lines represent folds). Note that the lines that I have drawn onto the photo are all approximately a 1/4" away from the obvious joins. This takes seam allowances into account. 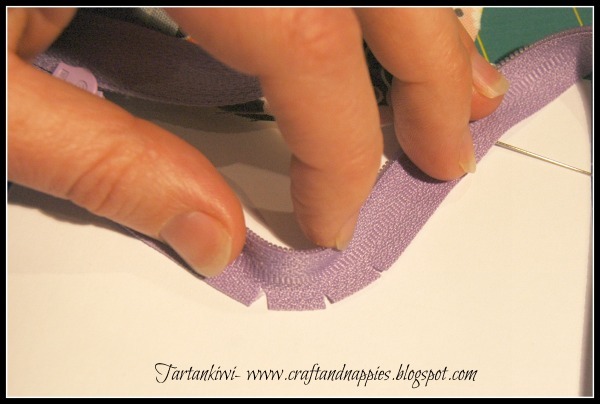 When sewing the pockets in place like to sew small triangles at the top, to strengthen them. Then pull the ends to the back and tie them neatly. 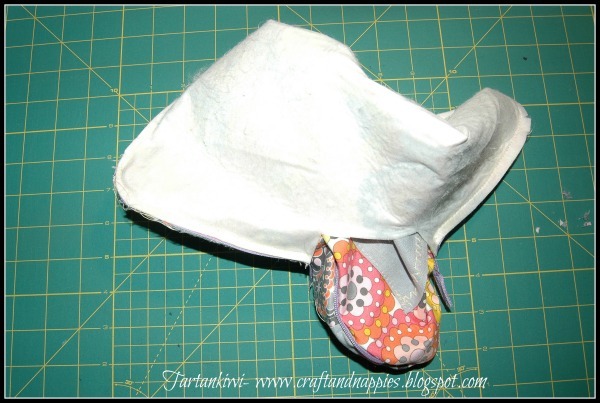 Take your zip and place it around the edges of the outer piece. 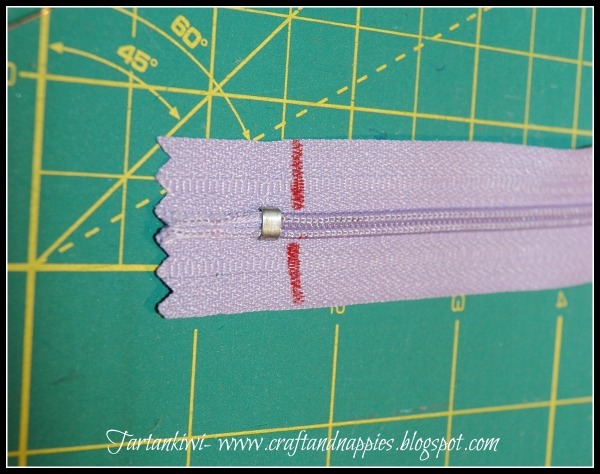 Ensuring that you have at least 2 or 3cm left at either end of the zip, make a mark on the closed end of the zip. This mark will help you to ensure that the zip is sewn evenly onto both sides of the pouch. Ideally the mark wants to be further away from the end than shown in this photo. Now open the zip and starting from your mark begin to pin the zip in position. Place the zip and outer right sides together (see the following two photos to help understand what I mean). When you get to the corners you will need to make three or four short snips in the zip at roughly 1cm intervals. This will help you to ease the zip round the corner. I tend to pin and then sew one half of the zip first, check it and then sew the other half. Mostly this is personal choice, but it was essential this time as my zip was a bit on the short side which would have made it a bit more awkward to sew. 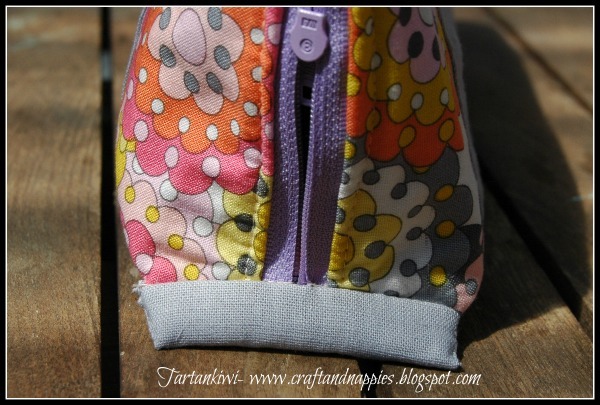 Once you have pinned the zip to the outer, place the inner on top of it, right side down. This creates a sandwich with the outer layer, then the zip, then the inner layer. Carefully pin again, ensuring that the zip does not move in the process. 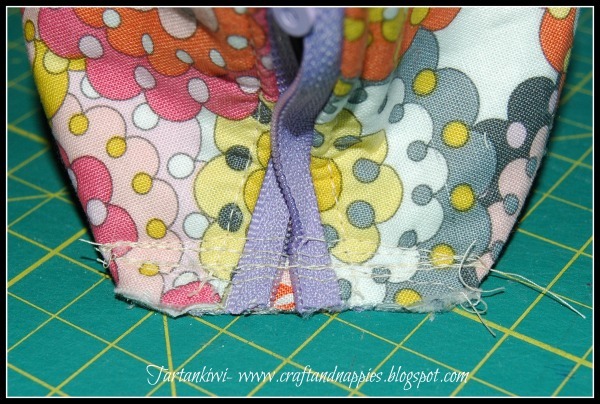 Put a zipper foot on your machine and carefully sew around the zip. Do not sew any further than the zip ends, the rectangular indentations need to be left open in order to turn the case the right side out. Repeat the same steps for the other side of the case and then turn the case the right way out. Once you have turned the case the right way out, finger press the edges and then top stitch around the zip. Create two small tabs for at the zip ends. 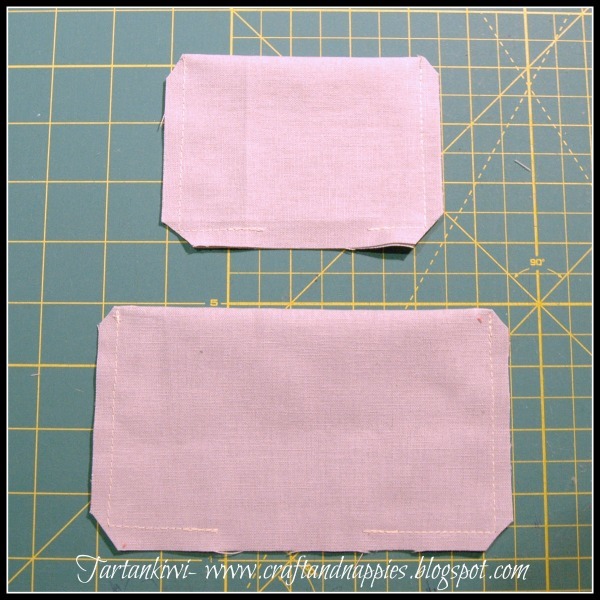 Fold the 2.5" x 3" pieces of fabric in half so that they measure 1.25" x 3". 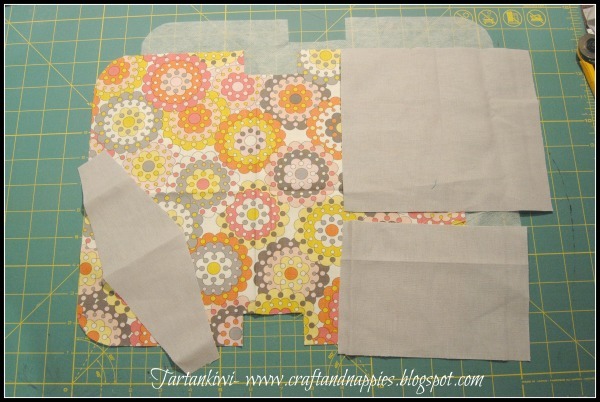 Then fold in the two sides in to the centre again creating a thin strip of fabric. Sew along the long edges. Fold the zip tab in half lengthways. Turn the case inside out. Pinch the ends of the case together so the raw edges of all the layers line up at right angles to the zip. 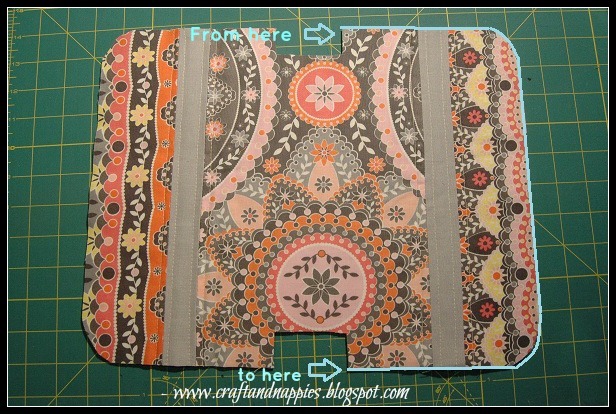 Place the folded zip tab in the middle of this bundle (you can just see it poking out of the bottom view photo). Sew the end of the pouch closed. I like to sew back and forwards a few times to ensure that I have secured the zip properly. Turn your case the right way out and smile at what you have just created. If you decide to give this a go, I'd love to hear how you get on and to see the results. As a final note I'd just like to say thanks again to Kym of Fabric Fascination for this fun opportunity. I have loved being part of your exchange! EDITED TO ADD: So so sorry everyone, I made a mistake when uploading the pattern and it came out very small. The problem has now been rectified and the pattern should print out at the correct size. I recommend that you download the pattern first and then print it. Ensure that your printer is set to print "actual size" and NOT "shrink to fit"
This looks great! 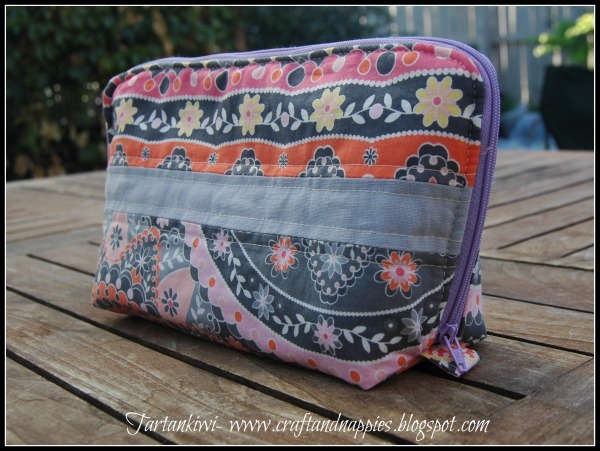 The zip is perfect - lovely, tidy sewing case! Oh, this is so lovely! thanks for a great tutorial! I NEED me one of these - I'm totally pinning it! 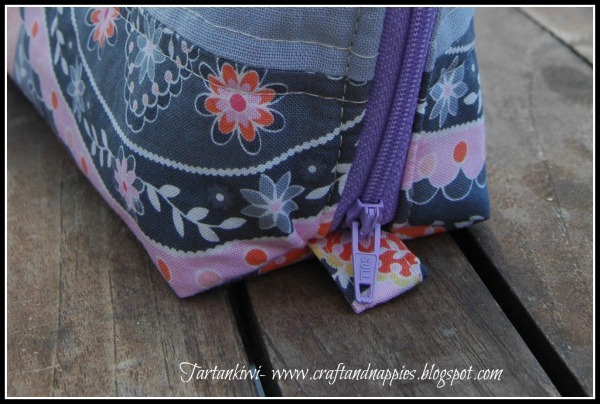 I think seeing your hexies poking out from one of the pockets is what convinced me - I have been taking my portable crafting out and about a bit recently and have had a bit of the spillage that you speak of - this is a perfect solution! Thank you! 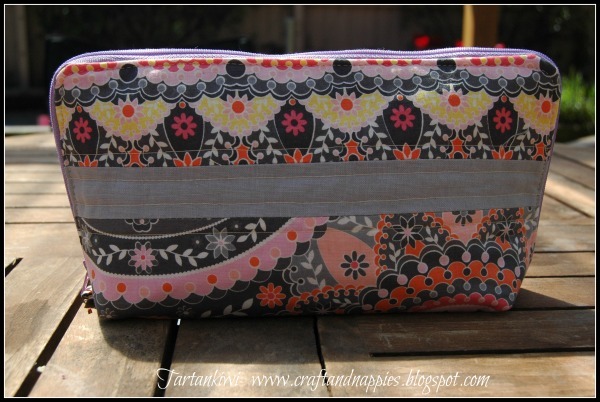 I love how the zip goes all the way to the bottom, making a fabulous sewing case. Thanks for the great tutorial, Juliet. I've pinned for future reference. This is great, thank you very much. I will make this as a christmas gift for a ten year old girl who has just learnd how to handle the sewing machine. I love it. I'm sure I'll do it. I love this pouch! Your tutorial is so easy to follow. I must admit sewing a zipper in the round seemed a little intimidating and you make it look so easy. I will surely try it! Hi - I just printed this - "Actual size" and it prints on A4 and Pattern A is then about 8" wide....yours looks to be 11". Do I need A3? Oh gosh! There is a mistake in the pattern. I have worked out where the problem has occurred and will sort it as soon as possible. Will email you when it is fixed. So so sorry and thank you for drawing my attention to this!!! 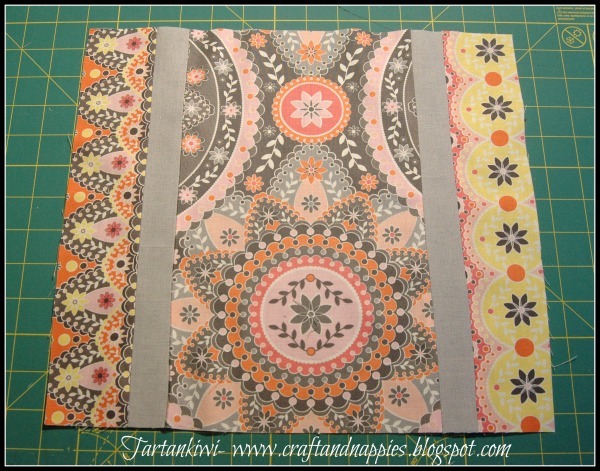 Thanks for sharing your tutorial...I have added it to Freebies for Crafters. If you go to the section "For the outer you will need", the first line says "the pattern" Click on the word "Pattern" and it will take you to a copy of the pattern in google documents. In the top lefthand corner you will see a small downward pointing arrow. Click on that to download the pattern. Make sure that you have your printer set to print original size. You do NOT want it to "shrink to fit"
Oh, my goodness, you are a genius! This bag is delicious! Can't wait to give it a try! I think this looks like a fabulous pattern! I think I may modify the pockets a bit and use it for a makeup bag!! Thanks for all your work! THANK YOU, THANK YOU, THANK YOU, I recently made a small Very Organized purse, like one that I purchased and Loved but wanted it a Little bit larger. I had a diffulcult time with the zipper (didn't think about clipping the corners And I will use your method to put the inside and outside together then No raw edges to sew seam binding All the way Around. JHolliman. So where are templates a & B? I like this bag. FYI: for those in the US the zipper should be about 24 inches. Can't wait to make this. Thank you, I do not know how to convert cm's to inches. Hi 2kids, you are a no-reply blogger so this is the only way that I can reply to your question. The case measures approximately 8' x 5" x 3". I am attempting to make this case but I confused on a couple of parts. At the spot where you state that you can do this before you turn the case out, how do you close it? In the same way by pinching and sewing down? Also at the part where it states bind raw edges how do you do that? 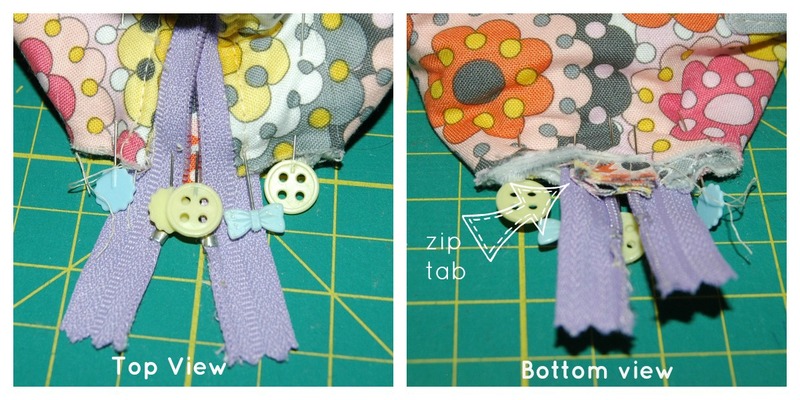 It's about 3 years since I wrote this tutorial and I haven't sewn one since then, but from what I remember, yes, you just pinch and sew the layers in the same way whether you do it before or after you turn the case out. Be mindful that you can only do the closed end of the zip while the case is still inside out. Fantastic tutorial Juliet and I love your case. Thanks for the tip with the curved zipper - really useful. Congratulations. I love submitting to Totally Tutorial. Ooooooooo! I LOVE your Zebra pillow!!!!!!!!!!!!!! Any chance you've a pattern for it??? Your eye for color is spectacular, too!